Back in 1934 there was boxing every day of the week in London and Sunday afternoon shows were very popular. On March 25th 1934 one could pay "three and a tanner" or less than 20p to get a decent seat and be entertained by boxers of great quality at the Blackfriars venue. 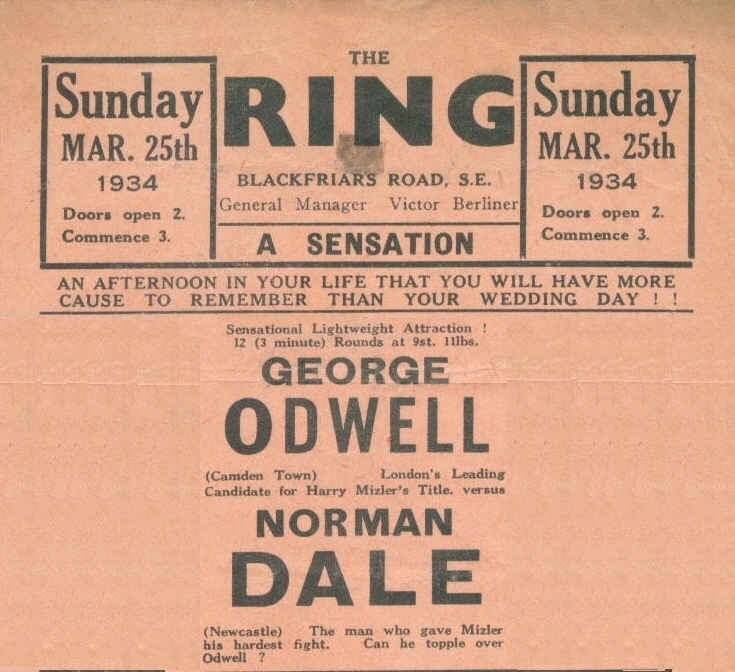 On the same day one could also watch boxing in London at East Ham Palais de Danse, the Chalton Ring in Euston, Merton Stadium, at Luna Park in Whitechapel, the Alexandra Arena at Stratford, the Central Ring at Wood Green and also at Stepney, where fans had the choice of boxing at either the Beaumont Hall or at the Osbourne Social Club. The real quality was on display at the Ring, London's leading small hall at the time. There were five bouts on the bill, two ten-rounders involving heavyweights and three contests over twelve rounds. 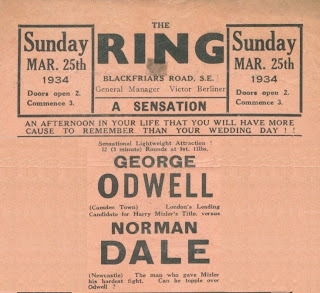 Top of the bill was a match between the big-hitting Camden Town puncher, George Odwell and Norman Dale from Walker in Newcastle-upon-Tyne. At the time these two were at the front rank in the lightweight class and they were matched at 9st 11lbs. 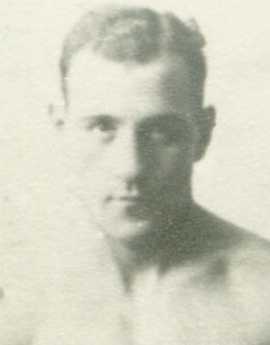 Dale had come down to London in late 1933 to take on Harry Mizler and had lasted the full distance at the Blackfriars ring. He had stayed on in London to further his career, as Newcastle, despite being an extremely busy and important fight centre, was just too far away from the action in London for a boxer from there to truly reach the top. He had met with reasonable success by March 1934 and the match with Odwell as a real tester. Odwell was a very big puncher with a fearsome reputation. He had gone 47 bouts since his last loss (in 22 months) and the ringside betting boys would have made him the favourite to win this one. However, Dale (below) was a very classy performer and he taught the Camden Towner a real lesson. 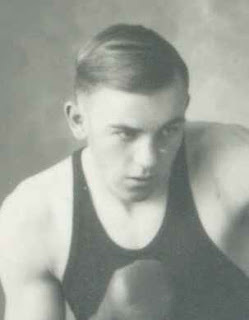 The report of the contest in Boxing states that "Dale was on top throughout, except for a short spell in the second round when Odwell proved effective with a double-handed attack, mainly to the body. Dale was never troubled after that, and he built up a commanding lead. He hit the harder, and with the greater accuracy, and he was infinitely superior in defence, so that in the final rounds Odwell was very much hurt and troubled. It looked as though Odwell needed far more experience against strong, skilful boxers, if he is to make the headway that has been expected of him. As it is, he is terribly lacking in versatility, and seems to rely almost solely on efforts to finish matters with his good right hook. But that was not nearly enough to make any headway against Dale." It was Odwell who made the most progress after this contest and later on in the decade he became just short of championship standard. Dale lost to Sunderland's Douglas Parker in a bid for the Northern Area Lightweight Title in September 1934 and he retired in 1935, his great potential partly unfulfilled. I love Boxing game and it's very amazing and enjoyable time when i watch any match. My favourite boxer is Muhammad Ali. He was great boxer and his winning rate was 95%. He change the trend of boxing. The above post have the detail of Ring Blackfriars and http://professionaldissertationwriting.org/ help me to know about the profile of both boxer who main player of this tournament.